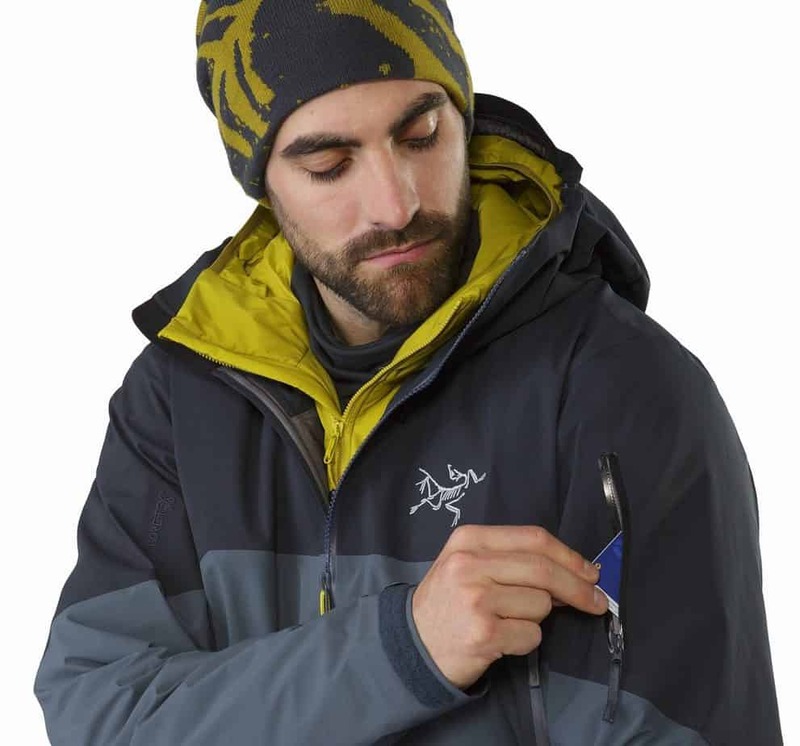 » The Arcteryx Rush Jacket Review – Should You Buy It? The Arcteryx Rush Jacket Review – Should You Buy It? If you have lived in a cold area and spent a lot of time hitting the slopes of a mountain, then you have probably been taught from a young age that you always need good outerwear. There are many different choices out there for great outerwear. We have owned a lot of them, but today we are going to share with you one of our personal favorites. The Arc’teryx Rush jacket is an amazingly high-quality jacket that is perfect for skiing or any other outdoor activity that you might be interested in. This jacket is going to keep you warm and will also help you to be able to keep active regardless of the temperature. Arc’teryx actually calls the Rush a “waterproof breathable and durable jacket designed for big mountain adventures and on/off piste skiing and riding.” This jacket has been perfect for big mountain adventures. The Rush jacket really does a great job at measuring up to other jackets on the market from competitor brands. What is your favorite feature on the Arc’teryx Rush jacket? Is there anything that you wish that the jacket has that it does not? Does it fit true to size? Is this jacket a good choice for those who are not active? Do you need special pants to attach to the snow skirt? Arc’teryx is from Canada. They were founded in British Columbia in 1989. The company was started by Dave Lane. It was originally named Rock Solid. The name changed to Arc’teryx in 1991. The name change was to reflect new visions for the company that the goal was to go through evolutionary innovation. In 1993 there was the company went through a series of relocations and added a number of staff members with the introduction of the Bora backpack. The company started making outdoor apparel in 1996 after they obtained a license to be able to use the popular Gore-tex fabric. In 2001, the company was bought by the Solomon Group. The Solomon Group was owned by Adidas but was sold to Amer Sports in 2005. By 2005 the company was moving forward to include products for a wide range of different products. These include hiking, snowboarding, climbing, backpacking, and skiing. The Arc’teryx Rush Jacket is one of the best fitting jackets that I have ever tried on. One of the things that is nice about this jacket is that it is loose, yet not the type of loose that trips you up. Instead, it is loose enough for you to be able to fit a mid-weight puffer jacket underneath it. This is the weight that you want in cooler temperatures and something that you will find allows for you to be warm and comfortable. While this might not be a big deal to you, for me it was nearly perfect and everything that I had been looking for in a winter jacket. In addition to allowing for layering, this jacket allows you to easily move around freely. This extra material that makes moving easy is something that allows you to be able to move around freely. Another thing that I really appreciated about the Rush were the sleeves and hems. The sleeves were slightly longer than other jackets. This made them more comfortable as I was moving and ensured that my wrists were never cold. They do have an additional inch on the hems so you can take them out to make them longer. You can also take them in more to make them shorter. This was a good fit on me personally and I would consider myself to be average size. I have owned other jackets that are considered to be similar or competitors to the Arc’teryx Rush. The biggest difference that I have noted is that they are a little bit baggier or looser than the Rush. However, this was not a good thing in my mind. In fact, it seemed to make it hard for me to move freely and made me uncomfortable. I couldn’t wear those jackets when I was not skiing or out in the cold because without a mid-weight layer they were too big. However, I could not fit a mid-weight layer under a smaller size. The Rush is still comfortable and fits well when I am not wearing a mid-weight so this is the biggest advantage for this jacket in my mind. Type of Jacket — This jacket is a shell jacket. Powder Skirt — This jacket features a powder skirt. Jacket to Pant Interface — This jacket has a jacket to pant interface. Primary Waterproofing — The primary waterproofing is the Gore-Tex membrane. Outer Layer Waterproofing — There is a different material that makes up the outer layer waterproofing. 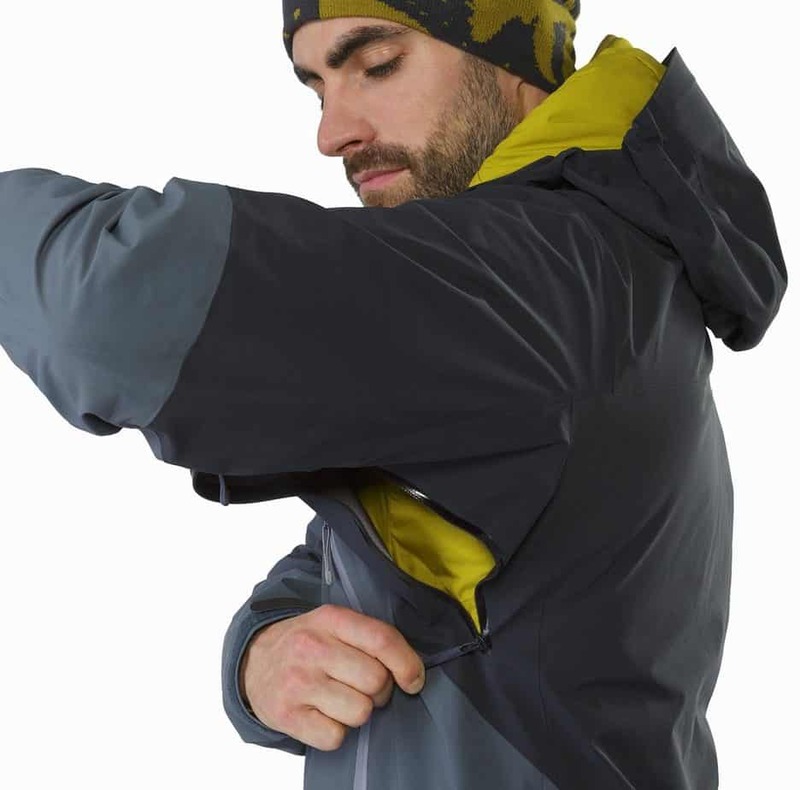 Venting — This jacket has pit zips for additional venting. Mesh Vents — This jacket does not feature mesh vents. Insulation Type — There is no insulation in this jacket. Taped Seams — This jacket features fully taped seams. Waterproof Zipper — This zipper is waterproof. Layer Count — This jacket offers three layers. Waterproof Rating — This jacket has a proprietary waterproof rating. Hood Type — The hood is contoured. Breathability Rating — This jacket has a proprietary breathability rating. Place of Manufacture — This jacket is imported. Waterproof Rating — The jacket has an excellent waterproof rating. Breathability Rating — The jacket has an excellent breathability rating. Warmth — This jacket does not offer warmth. Fit — This jacket has a normal fit. Packability — This jacket is thin but definitely not the thinnest. The Arc’teryx Rush jacket is made of the Gore-Tex Pro fabric (N80-p-X). This fabric offers a smooth and soft feel thanks to its 80 denier count. It is significantly softer than the 80 denier fabrics that other brands have. The additional features of this new version of Gore-Tex are really nice and offer a number of things that you are not going to find on other jackets. The fabric is really durable and waterproof when compared to the older version of the material. You will love that this jacket is durable and comfortable at the same time without feeling weighted down or heavy, but without being too light at the same time. When I first got the jacket, I was confident that I would be able to use it or years to come and that it would be durable. One of the things that made me believe this was the new Gore-Tex Pro textile. This textile has been used in additional Arc-teryx items like the Stinger Pants. Those who have purchased the Arc’teryx Stinger Pants are one of the most popular items from the brand and have a cult-like following. People who are using them choose these pants time and time again. It is reported that the average user can use their pants for seven to ten years. You can probably guess it, but there are a number of things that you can expect from the Arc’teryx Rush jacket like that it is both windproof and waterproof. Many waterproof fabrics are not at all breathable. This is something that you have probably wondered about as you were reading this review. How can a fabric truly be waterproof and breathable at the same time? I’m not sure, to be honest, but this fabric does a good job of it. One of the things that I loved with this jacket when I was testing it was that I was able to put up the hood, continue the activity, and the hood stayed in place. This is often not the case with jackets and in the past, I have even chosen the versions of jackets without the hoods because it drove me crazy that they never stayed up. I am so glad that this jacket only comes with the hood and that I went for it. Plus, I really appreciated that I did not get sweaty even when I had my hood up and was involved in activities where I was exerting myself. Now, I will admit that the more that I worked, I was able to actually build up a layer of sweat inside my jacket, but I had to be working out hard. I was running and cycling without sweating and it took some good old fashioned mountain hiking to do so. One of the great things that happened when I got sweaty was that it eventually dissipated and did so quickly as I stopped exerting myself, so that was different than what I have had with previous jackets. There are some shells that have more air permeation and more breathability. However, this jacket has been better in our opinion because it does feature some increase in the airflow and they have to be more breathable. Our overall impression was that the protection with the breathability was far superior to some of the other things that we saw. We really like this fabric and know that we will look for it being used in future purchases. When you look at the overall construction of the Arc’teryx Rushyou will be impressed and certainly not disappointed. This shell is very nice and it features all of the things that you would be looking for in a high-end jacket. 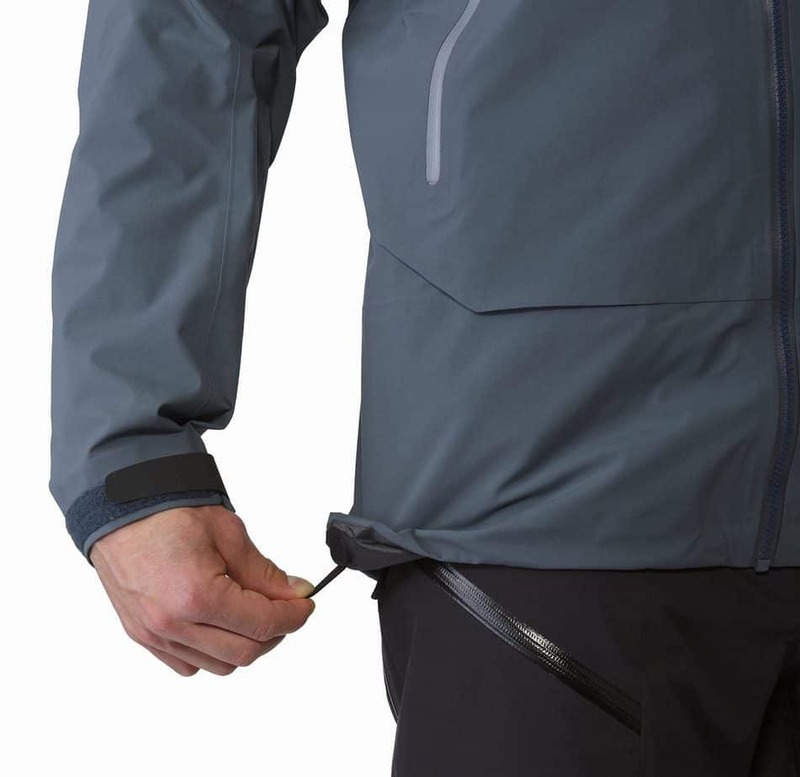 The seam tape, waterproof zippers, and high-quality construction at the seams make this jacket comfortable. The Arc’teryx Rush features some of the latest technologies for outdoor pieces. The jackets feature a lot of different types of material that makes it comfortable. One of the materials that is a part of the Arc’teryx Rush is Gore-Tex. Gore-Tex is a high-end fabric that has been marketed to companies like Arc’teryx because it offers features that make it easily breathable while being waterproof. One of the best things about this brand is that it is well trusted and you know that your jacket is going to keep you dry. The claim is that Gore-Tex allows the jacket to be 36% more breathable than the previous line of Gore-Tex fabric. You can actually find a lot of information about the new Gore-Tex Pro and the previous Gore-Tex Pro Shell. This will help you to understand just how improved the fabric that is being used by Arc’teryx. There are actually a couple of different fabrics that are used for the outer shell on the Rush. Arc’teryx uses a heavier fabric that is more durable on the shoulders of the jacket. This is an 80 denier fabric and it actually helps this area of your jacket hold up better. The other fabric is a lighter fabric. This lighter fabric is used on the sleeves and lower torso. The fabric is more packable. It is actually called a 40 denier fabric. There are so many features of the Arc’teryx Rush that you are sure to love. These are the things that were most important to me and my thoughts on them. There are so many different features and components that you can consider when you are picking out a jacket. By looking at what the Arc’teryx Rush has to offer you will not be disappointed and we bet that you will actually be impressed. This jacket is reliable and works well without any of the things that you do not want to see from a jacket that you are meant to be active in. It is never heavy or clunky. It is a jacket that features clean lines and is minimal while offering top protections. One of our favorite features is the pockets. In fact, there are five pockets in the jacket. There is a built-in pocket on the left arm so you do not have to worry about how you are going to show your lift pass when skiing. In addition, there are two big outer hand pockets, a small inner security pocket, and an inner drop pocket. The hand pockets are big enough that you can store your ski gloves in there while allowing you to have easy access to them. The inner drop pocket is also really nice for stuffing gloves, a flask or water bottle, or a hat into. It is made from a stretch mesh which makes it better for this purpose. In addition to this, you are going to love the hood. You can actually fit this huge hood over your helmet, but do not worry you can adjust it from both the front and back to ensure that it is going to fit securely to your head and not be too large. The hood adjustment cords are easy to use you and you use them easily while you are on the move. Finally, the zipper is a very well made zipper that is chunky and something that is going to last for a long time. One of the things that is great about this zipper is that it is easy to use, even in freezing temperatures or temperatures where the zipper could potentially freeze itself. In addition, there are nice zipper sliders found on the pockets which help to ensure that you do not use belongings. They also help to keep your pockets waterproof for your items so that you do not have to worry about things being ruined. You never have to worry about the zippers getting wet or with problems as they are waterproof as well. Finally, the pit zips are also high in quality and work to help you with ventilation. Finally, the snow skirt in this jacket is internal. 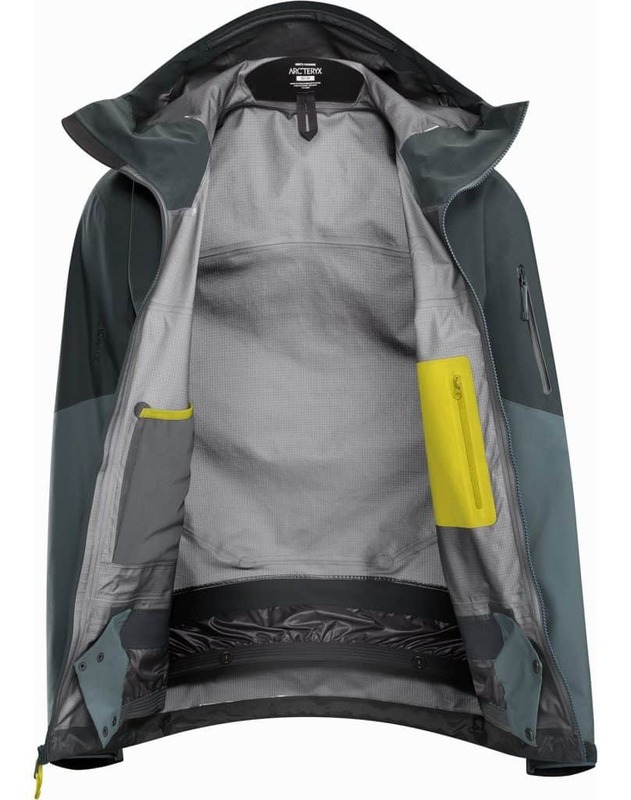 This snow skirt actually has attachment points which help to connect the skirt to Arc’teryx pants so that you do not have worry about snow splashing up your jacket or down your pants when skiing. Most of the time when I am wearing this shell it is really cold out. This means that I had a base and mid layers on as well. However, there have been times when this jacket has been on my bare skin because I have been out in cold windy days where I need something to break the wind but I do not need something to keep me warmer than a light jacket. I love the Rush for this purpose. When I have used other jackets on my bare skin, I have often noticed that they are not that comfortable and that I get sweaty when I am wearing them. I had thought that the Gore-Tex Pro Shell was a great choice before but if I was very strenuous, I did notice that I got sweaty inside my old shell. So, when I got this new one that promised better breathability, I was a skeptic. However, being out and being active in the Rush was like a breath of fresh air. It was a great change of pace to find that I was never sweaty, no matter how hard I was working out. This shell was significantly better than any shell that I had ever used before in my life. The best part of this jacket is that while I was always warm, I was also cool. I was able to stay comfortable in all types of weather and with all types of choice. I loved that I could use it to keep warm and to keep some things cool as well. 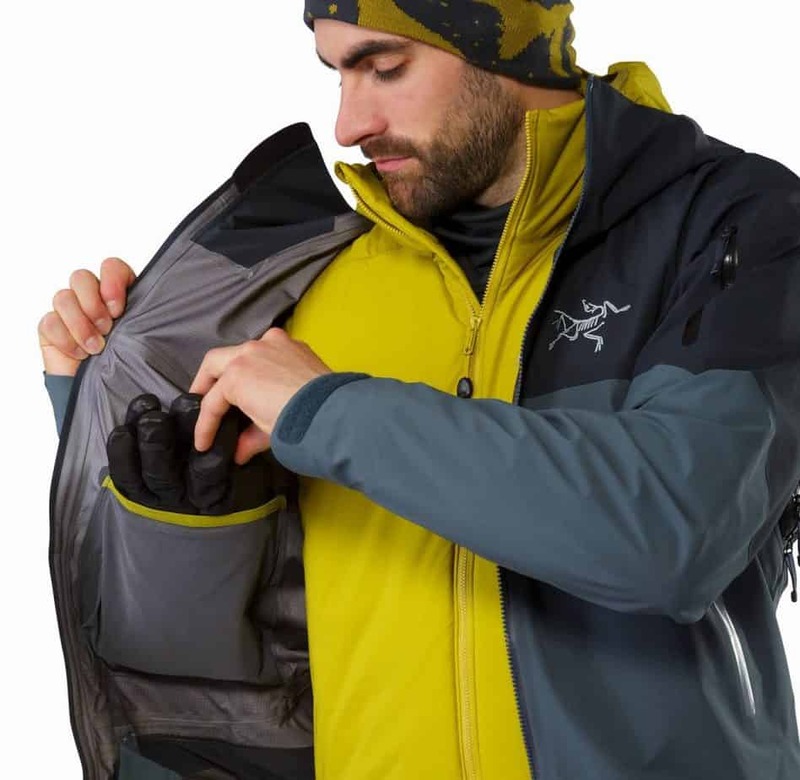 The jacket is also foldable which makes it great for traveling and the fact that it can be used in different types of conditions makes it perfect for taking with you no matter where you are going, especially if you are traveling in the winter months or to areas that are known for being cold. Recently I read a review by someone living in Alaska and he praised the Gore-Tex Pro when compared to the Gore-Tex Pro Shell. He credited it with being the type of jacket that he could wear on warm Alaskan days without sweating, but still keeping him warm even in the coldest Alaskan winter conditions. So, while my own experience was completely positive since I live in a middle climate area, it was nice to know that this jacket was a good one to use in climates that were considerably colder. When I was testing this jacket I was having a more active winter than normal. The Rush was put through a lot of abuse as I was not careful with it. In fact, it went through a patch of trees with me when I did not judge my steering on a, particularly steep hill. It fell down a mountain with me. Plus, it was taken on some rides with snowmobiles and through other abuse as I used it all winter long. In addition, it was with me while I was working on some outdoor conditions including a small avalanche. This included shoveling and digging out things as well as other labor. I have always been this active in the winter but rarely have I had a jacket last all winter and still have it look new at the end of the winter. The Rush was a huge surprise in quality. Another thing that I should mention is that the zippers are extremely durable. In fact, the zippers are the most durable zippers that I have seen in a long time. They are water resistant too which means that they work to protect you and your items from the elements. During a normal skiing season, I end up with jackets that do not have zippers that work everywhere. I always tear up zippers and I did not break even one of these zippers on the Rush. When I saw the molded plastic zippers (Vislon) on the jacket, I was worried that they would not work well. As they were the actual front zippers, I assumed when I had this jacket that I would be returning it for tearing up too quickly. However, I was wrong. I have not had any other plastic zipper ever last me in my life and this was shocking to have one that is still going strong after so much abuse. I did notice that there were some different places where there was a small amount of wear. That was where the exposed velcro rubbed against the lining of the shell. In this area where the sleeves were worn out, you could see the Gore Pro membrane which is the inside material. So this was a little disappointing since I had such good luck with every other part of the jacket and something that I hope that Arc’teryx will take to mind and work on recreating the velcro where it will not do this to the jacket. I am not sure what a solution would be, but I feel like there has to be an easy one that would keep the jackets from wearing out there and make them as durable in this area as they are anywhere else. I was wearing the Rush in a lot of different conditions, including the really wet season in the Pacific Northwest where I visited. I noticed while I was there that the Rush worked better than any other rain jacket that I have ever purchased in my entire life. It just kept me completely dry. In addition, it was great for rainy days on the slopes and for skiing in all weather conditions and I never once had to worry about being wet. The Rush held up through all wet conditions that I tested it out in. I have found myself reaching for this jacket in wet conditions a lot because I know that I will be able to stay dry. I even found myself reaching for it in the cooler part of spring. The pockets on the Arc’teryx Rush are very nice. They are completely functional and the design makes sense. There are two large hand pockets on the outside and my ski gloves fit into the hand pockets easily. I was able to get into them with my gloves on as well. On the left side, there was a small inside pocket that is made from mesh for you to store your things in. This pocket is tight and it is waterproof so it is perfect for things that you would like to have comfortably accessible for you. In addition, it has the pass pocket that I previously mentioned. As someone who has a pass each winter, having this pocket where you can just show your shoulder makes my ski trips so much better and I never have to worry about the possibility of losing my pass if it has been pinned to me. I had this happen one winter and it was so hard to get back to the ski lodge to have it replaced. Plus, it wasted part of a day of skiing. Another feature of the Rush that I was a big fan of was the hood. The hood is one of the best hoods that I have had the joy of reviewing. I love how it was big enough for me to wear my hat or helmet as needed, but that it was also able to cinch the hood to where it would fit without either of these. In fact, the cords were so easy to cinch. Plus, I never had that loose hood that got in my way where I was not able to see while I was skiing. I never lost any layer of my vision. The special cuff that is on the hood is really nice too. It is in a position that allows for it to block snow, but where it is not going to obstruct my vision or where the goggles are at. There are a number of additional features that I wanted to talk about in detail. One of these is the pit zips. Another is the powder skirt. These are both things that you are going to find that you never knew that you need, that you suddenly want. The best feature of the pit zips was that they were large and easy to zip and unzip, even with gloves on. The powder skirt is something that I did not know that I needed when it came to finding a great ski jacket. 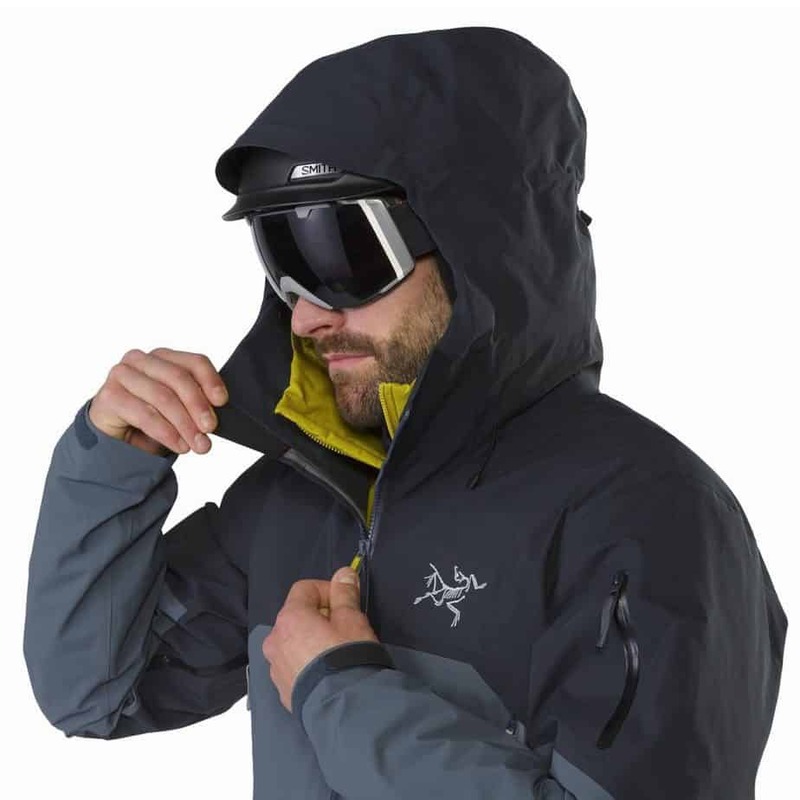 The powder skirt is a part of the jacket that works to help keep the snow from going up your jacket or down your ski pants when you are more active or when the snow is deeper. The Rush jacket fits well with the Arc’teryx Stinger pants, but the company says that it will fit with any of their pants. The way that these two connected was with simple metal clips. These are my favorite of all of the connecting pieces that I found. However, it is important to mention that the skirt is not removable. So, it is something that you will always have when you are wearing a jacket. This does not bother me but there are people who might not like having that additional material. Finally, the cuffs on the jacket were nice. They fit well with all types of my gloves and were something that I was very comfortable with. They even cinch down to ensure that snow never goes up your sleeves. To name just one feature on the Arc’teryx is hard because there are so many that I love. That being said, I really appreciate the hood on the Rush. The hood is perfect for all conditions and works well with and without a hat. Plus, I never have to worry about the hood being in the way as it did not block my vision at all. This has not been the case with other hoods that I have had on other jackets. There is not much that I would change about the jacket. That being said, I wish that there were some additional vents that you could unzip in warmer months. While I understand that additional vents would mean that it would not be as waterproof when those vents were open, there are other similar class jackets that feature these to help keep you cool. Had I had extra vents when I was sweating, I would not have been sweating at all. The jacket fits well and true to size. While it is somewhat oversized so that you can add a mid layer and base layer underneath, it is a jacket that is not too bulky. I have heard of people who do size down, but then they cannot use the jacket with these additional layers, so this would not be my personal suggestion. One of the things that is really nice about this jacket is that it is good for everyone. You do not have to be active or a skier to appreciate the features. They are great features that you will love in the winter, spring, and fall no matter who you are. This is a high-quality choice and one that would last non-athletes for many years to come. You do not need specific pants from the Arc’teryx lines but you do need to have Arc’teryx branded pants. There are many that you can choose from. There are many choices and you can find the one that works best for your personal needs and how you would be wearing them. One of the things that I am reminded of with the Arc’teryx jacket is the price. It was a very expensive jacket. While I really like it, I am not sure that I would rate it as the best value. There are a lot of other shell jackets that are more expensive, but there are also a lot of them that are cheaper. This price point is in the middle, but the features and durability seem to be as good as any higher priced model, at least the ones that I have personally tried. One of the things that can assure you that you are getting a good value for your money is that the jacket does feature high-quality materials and the construction methods are never cheapened. The other jackets that are in this price range are probably not going to last as long as this one. This jacket has become my go-to for skiing and any winter or spring weather where it is going to be rainy or wet. This jacket is a great choice and one that I am sure that I will replace when it is no longer wearable. That being said, I would guess that it will last for five years or longer with my activity level, so for most people, it will probably last even longer than that. 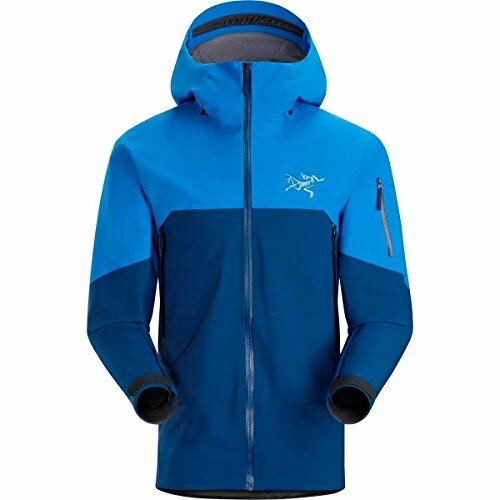 I highly recommend this jacket from the tried and true Arc’teryx brand! 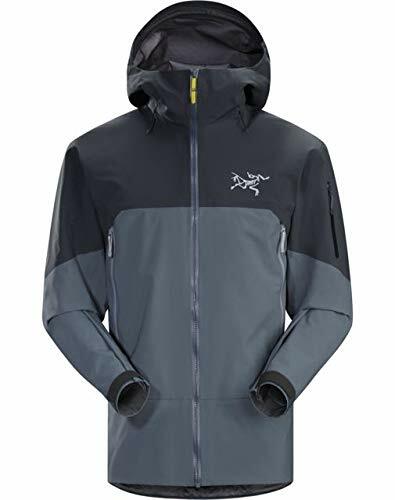 Arc’teryx Thorium AR Review [2019 Edition]: Is it the Perfect Hoody Jacket?